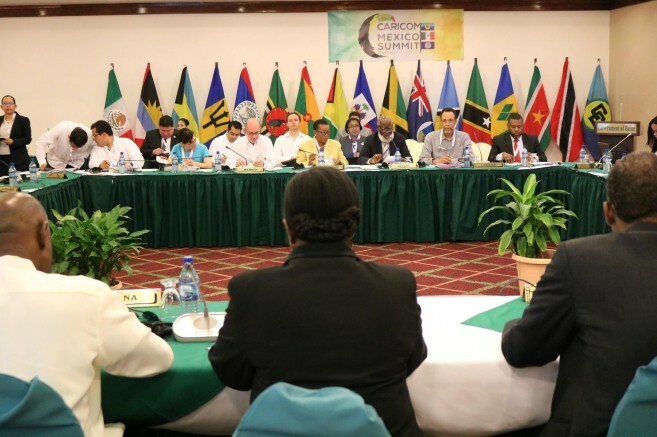 Mexican President Enrique Peña Nieto arrived today, October 25, to participate in the IV CARICOM Mexico Summit. On hand to receive him was the Minister of Foreign Affairs, the Honourable Wilfred Elrington. 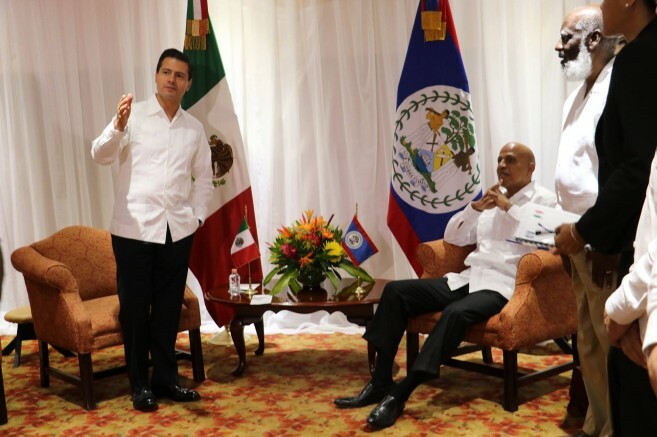 Though this is President Peña Nieto’s first visit to Belize, he emphasized that the visit is not merely protocol but reflects longstanding relations that is evidence by the substantive cooperation and bilateral engagement. Peña Nieto met with Prime Minister Barrow in a private bilateral meeting in which both Heads reviewed the state of play of the longstanding and friendly bilateral relations between Belize and Mexico, as well as cooperation in areas of mutual interest at the global level. In appreciation of the excellent bilateral relations that exists between the two countries President Peña Nieto presented a full-size replica of an OLMEC Head to the people and Government of Belize. The Head was installed at the inner circle of the North Ring Road Roundabout in Belmopan. In the area of cooperation several important announcements were made. President Peña Nieto formally informed Prime Minister Barrow that Mexico will be supporting the opening of a secondary school in Toledo District modelled after the Escuela Secundaria Tecnia Mexico in the Corozal District. 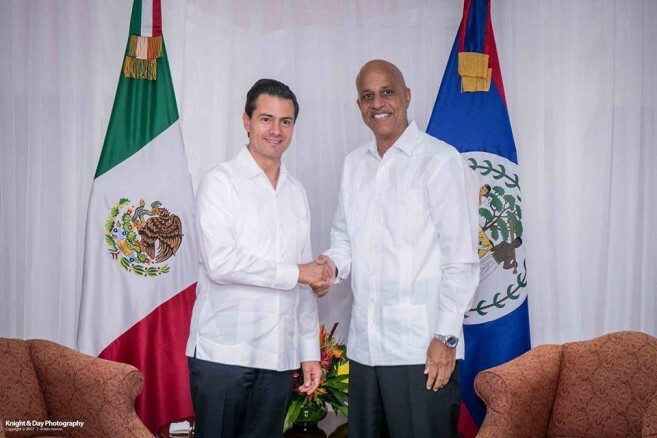 He also announced the three-year programme supporting the provision of partial scholarships to 25 low-income Belizean students for studies at Escuela Secundaria Tecnia Mexico. 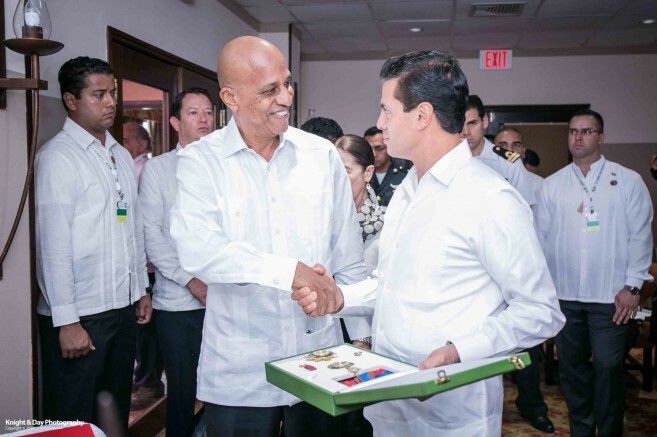 Mexico and Belize also agreed to continue cooperation in maritime security between the two countries. In addition to the long term ongoing capacity building programme provided to the Belize Coast Guard by the Mexico Naval Academy, President Peña Nieto offered support for the construction of two large patrol boats, measuring 30 meters in length for use by the Belize Coast Guard in its patrolling duties. On the economic front both Heads agreed to the importance of strengthening trade and investment through the conclusion of the negotiation of the Partial Scope Trade Agreement (PSA). President Peña Nieto committed to the prioritization of the negotiation of the PSA between Belize and Mexico for the first semester of 2018, following the conclusion of the renegotiation of the North American Free Trade Agreement. On the aspect of strengthening the legal framework between the two countries, both Heads were pleased to note that cooperation in the areas of air transport, land transport, education, and transboundary hydrocarbons were to be consolidated shortly with the imminent signing of agreements in all four areas. The meeting concluded with the conferral of the Order of Belize from Prime Minister Barrow to President Peña Nieto.